I don’t know what it is about the third period, but the Penguins have been playing their best hockey in the final 20 minutes of games. The Penguins got a pair of goals from Tyler Kennedy and Pascal Dupuis 43 seconds apart in the third period to give them a 3-0 win over the New York Rangers at CONSOL Energy Center on Saturday. The difference today is that the Penguins didn’t have to come from behind to get the win. Rookie Beau Bennett scored in the opening 1:30 minutes of play to get a 1-0 lead that they added to in the third period. Overall, the Penguins played strong defensively and had different players like Bennett, Kennedy, and Dustin Jeffrey step up and produce big games – especially with shutdown D-men Dan Girardi and Ryan McDonagh closely covering Sidney Crosby’s line. There’s a lot the Penguins should be pleased about in terms of their performance Saturday, but the absolute best part of the win is that Marc-Andre Fleury made 23 saves to get his 23rd career shutout – surpassing Tom Barrasso to set a new franchise record. Marc-Andre Fleury has his named etched on the Stanley Cup. Now he has his name etched in the Penguins’ record books. Fleury became the franchise’s all-time leader in shutouts with his 23rd career blanking – stopping all 23 shots sent his way by the Rangers Saturday afternoon at CONSOL Energy Center. Fleury is already the team’s all-time winningest goaltender with 241 wins. 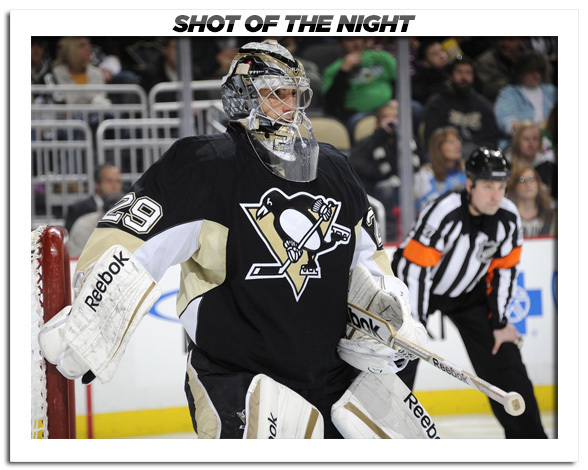 Now Fleury owns both major goaltending records. After their second straight comeback victory over the Leafs in Toronto on Thursday, the Penguins spoke after the game about how they couldn’t keep playing with fire or they’d get burned in terms of getting behind and having to rally. They put their words into action on Saturday, opening the scoring just 1:30 into the first period and coming out with a very strong start. The Penguins badly outplayed the Rangers in the opening frame, controlling play and giving New York virtually zero zone time. For the longest time the Rangers didn’t have any even-strength shots on goal, getting their first two on a power play halfway in and finishing the frame with four shots. The Penguins have a bit of work to do in terms of putting together a full 60 minutes, as the Rangers woke up for the second period and had the Penguins trapped in their zone a lot. But the Penguins finished the Rangers off in the third period and had an overall consistently strong effort. Before the game, Trib Total Media’s Rob Rossi asked Penguins coach Dan Bylsma to assess the play of rookie winger Beau Bennett. Bylsma said that he’s noticed Bennett looking more comfortable with the puck and making plays when he has it on his stick. We saw that on from Bennett on Saturday, as he opened the scoring with his second goal of the season – giving him seven points (2G-5A) in his last 10 games. On the goal, Jeffrey chipped the puck into the Rangers end where Bennett found it in the circle. He immediately wound up and took a slapshot, beating Henrik Lundqvist far side with a bullet. Local product and Rangers rookie J.T. Miller made his hometown debut on Saturday, skating 12:30 minutes and bringing a physical presence with a team-leading five hits. Dupuis’ 14th goal this season gives him seven goals over his last six games.